Hollybeary Creations : NND February Release Day 3! NND February Release Day 3! Happy Valentine's Day everyone!!! 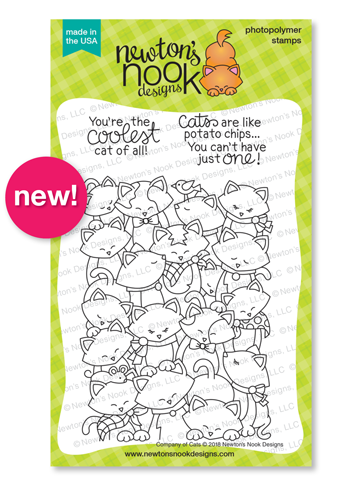 It's day three of the Newton's Nook Designs February Release and today we are introducing Company of Cats. When I first saw this set I knew I wanted to try to create a Monochromatic card in Black and White. I stamped the image onto some X-Press it Blending cardstock using Copic Friendly ink. I used a variety of Copic C markers to color the image in. I die cut a Black frame from the Frames and Flags Die set and then I trimmed the image panel to fit inside the Frame. I adhered the frame to a White card base with some foam tape. I wanted a little pop of Silver so I added some Silver Glitter Nuco drops to the center of the collars. I die cut two banners with the same die set and stamped the sentiment on the White one and trimmed them to fit along the edge. I used a mini staple to hold them together and adhered them to the card front with some foam tape. Lots and lots of kitties! Beautiful monotone colouring! 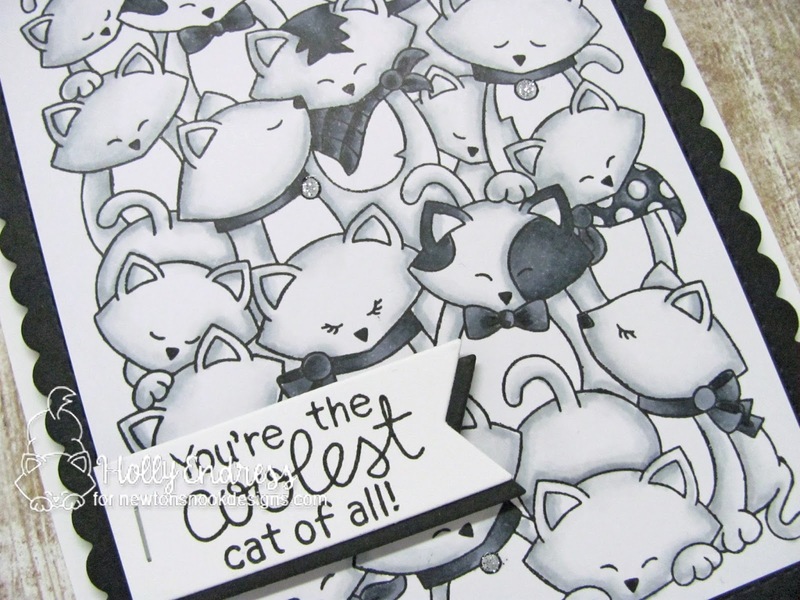 Awesome coloring on your b&w card! Love the kitties! Love this card, so many possibilities for coloring. I love the monochromatic look! very beautiful! and those cats..so cute!! Looks great in the monochromatic scheme. Fabulous shading!! OHHHH this is so eye catching, I love the grey/black/white, and little silver tags, AMAZING work! This is awesome!! LOVE the monochromatic look...looks so good with the touches of silver and the black scalloped border. Love your double banner for the sentiment too! I would have been scared to go monochrome thinking it would be too boring. Clearly I was ever so wrong, because this card is gorgeous. So clean, but so lifelike too. 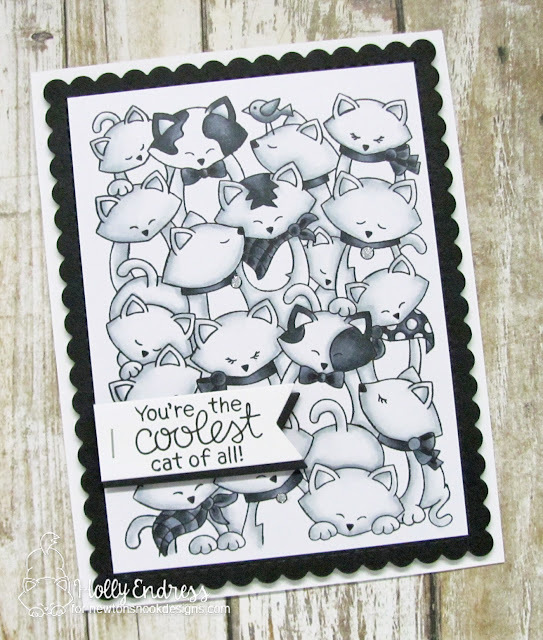 Thank you for showing us this lovely card; I'm now inspired to try some monochrome coloring myself! I really like the grey scale look you did for your card! Wow ! You did such a fantastic job with this black and white card ! Super cool design ! that card is so greta! I want to be in the middle of this pile of cats!! Love the fab B&W coloring!! Love this new stamp of Newton and his friends. Even more, I love your coloring! It is difficult to blend so seamlessly. Well done! Great card - super unique and love the different kitty styles! see such a pretty black & white card. love your take on these cats! great job! Wow! Love so much how you colored this adorable card!!! I don't know if I would have thought of doing this in black and white it's really clever. So cool with your monochromatic coloring. I have to say that your card is stunning! It looks amazing in black and white! Gorgeous card! Love the black and white colouring! Oh this is fantastic, love all the gray shading. This reminds me of a black and white film! So cool! Love this simple colour palette. Thanks for the inspiration.